Souvlaki, as you probably know, is a popular Greek fast food is commonly made with meat (and sometimes vegetables) threaded on skewers and grilled. A twist on the classic, this version uses not-so-authentic tofu as the main ingredient. Be sure to squeeze it of excess moisture and marinate it for as long as you can for the best flavour. You can also do these on the grill instead of under the broiler. The Maroulosalata is a light, fresh side dish–and just a note: some versions of this classic salad use 1/4 cup (60 ml) red wine vinegar in lieu of the lemon. Just whatever you do, find some good, crisp lettuce. Whisk all marinade ingredients together. Add the tofu, peppers, and onion, and let marinate for at least three hours, or overnight. When ready to cook, place the oven rack about six inches (15 cm) from the broiler. 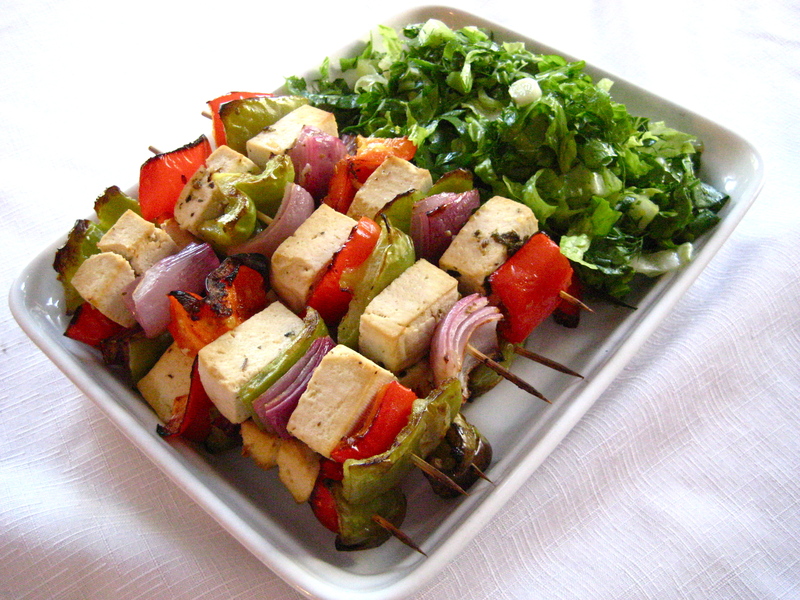 Thread the vegetables and tofu onto the soaked skewers, then broil, about five to seven minutes until browned. Carefully flip each skewer, then broil about five minutes longer on the other side. Serve warm. Toss salad with green onions, dill and zest. Add olive oil and lemon juice, mixing well. Season with salt and pepper to taste and serve immediately.